We’ve been short on time and energy lately when it comes to dinner, and I’ve been coming up short on ideas for delicious dinner ideas that can be ready in 20 minutes of less. 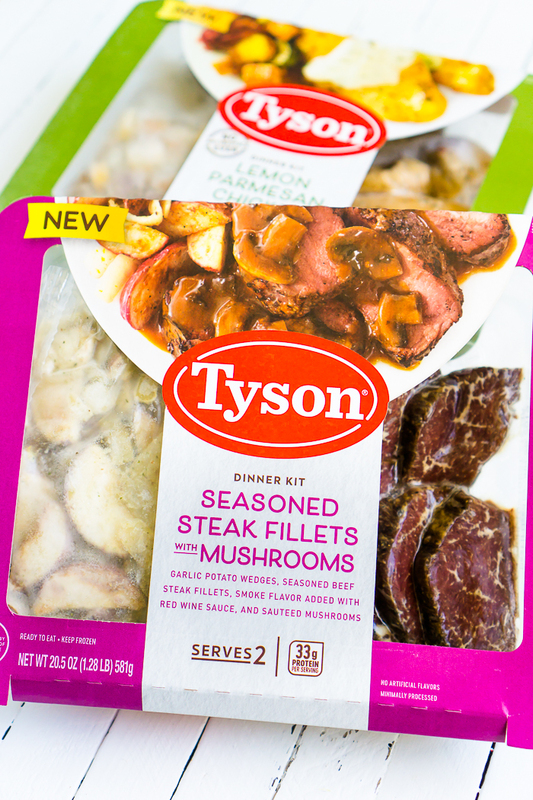 So I was really excited about this Seasoned Steak Fillet & Mushrooms Dinner and Entree kit from Tyson®! 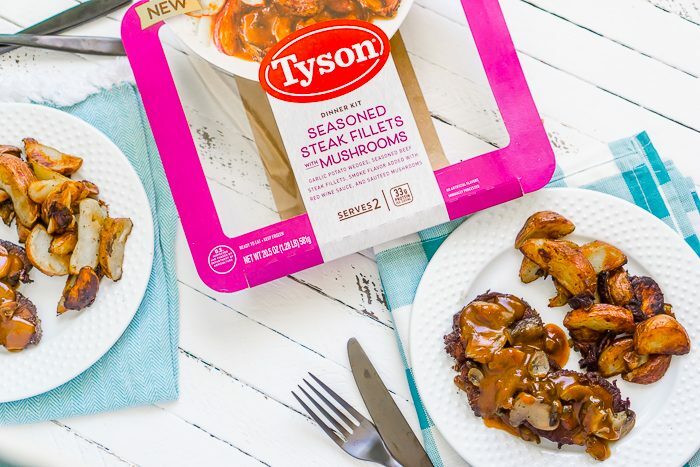 Easy and Delicious Dinner in 20 Minutes with Tyson® Fully Cooked Dinner and Entrée Kits! We moved into our house almost two months ago, and I feel like life hasn’t slowed down for a second the past few months. First, there was packing up our previous home which makes work difficult when you work from home. Then, there was the actual moving process with a toddler who handled it better than we ever expected but still made moving infinitely more difficult. Now, there are new windows, landscaping projects, closet installations and painting almost every paintable surface in the house. Which all basically means I’m tired and cooking has not been at the forefront of my efforts. Our meal planning and dinner prep has really taken a bit of a backward slide these past three months, which usually means we’re ordering out a bit more, eating more sandwiches, or eating “cheat” food that isn’t all that healthy. You start to feel it after a while. With things beginning to slow down a bit, I have more time for our normal dinner prep but I also want to be better prepared for the days that do run a little extra packed. These dinner kits are made with proteins and vegetables that are prepped and portioned and then frozen at the peak of freshness. I really love how they are portioned for us because it helps us eat a better amount without any brain power. These dinner kits have high quality meat that is fully cooked and vacuum-sealed into the tray without any freezer burn. I was really impressed at how quickly the seasoned steak fillets cooked on the stove and how tasty they were! My husband was so excited to be having a steak dinner instead of a peanut butter and jelly sandwich. Supposedly there are only so many a person can eat in a week. 😉 The chicken dinner kits are made with all natural* Tyson chicken, which means no antibiotics ever! *Minimally processed and no artificial ingredients added. 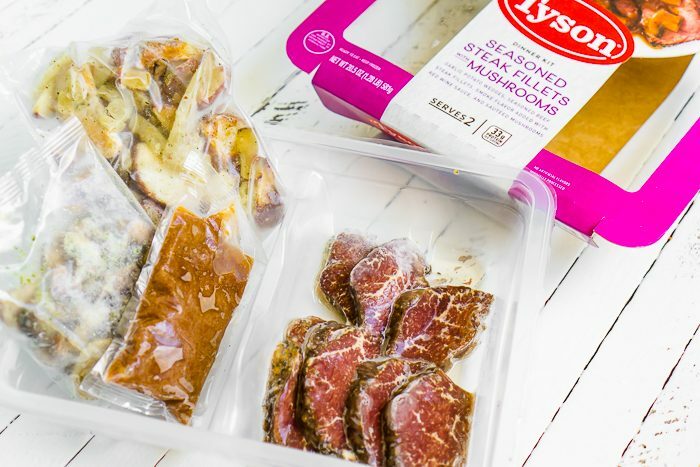 While I love that these Tyson Fully Cooked Dinner and Entrée Kits take the thinking out of meal planning and prepping for me and how great they tasted, I really love how easy and quick they come together. Total time from start to finish was 20 minutes for me, which includes cooking the steak, mushrooms, and potatoes. I can handle that even after a full day of work, Liam, and house projects. 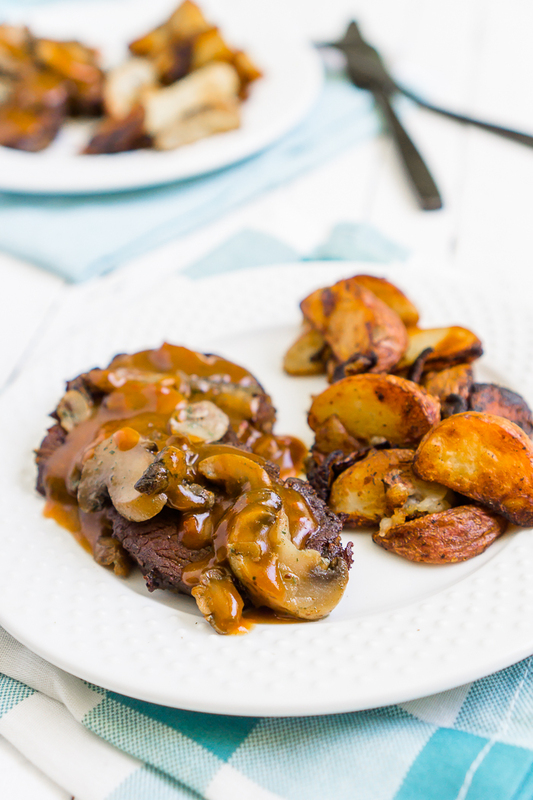 NOW, LET’S COOK THE TYSON SEASONED STEAK FILLETS WITH MUSHROOMS AND GARLIC POTATO WEDGES! PREP: Remove your pre-portioned packets and vacuum seal on the tray. If beef is frozen together, microwave for 25 seconds in the tray or on a plate until they separate. Add streaks to unheated skillet with 1 tbsp oil. Heat uncovered on med-high for 5 minutes. Turn steaks and cook for addition 2 minutes for medium or 4 minutes for well done. Remove steaks from skillet and plate. After steaks are removed, use the same pan and add mushrooms to skillet and cook 2 minutes of medium heat while stirring frequently. Top mushrooms onto steak when done. While steaks are cooking, add potatoes to a second (unheated) skillet with 1 tbsp oil and 1 tbsp water. Cover. Cook on medium for 5 minutes. Remove lid and continue to cook for another 3-5 minutes, stirring occasionally. Plate potatoes with steak. Tear a notch in the sauce packet to vent and place upright in container. Heat for 45-60 seconds or until hot. 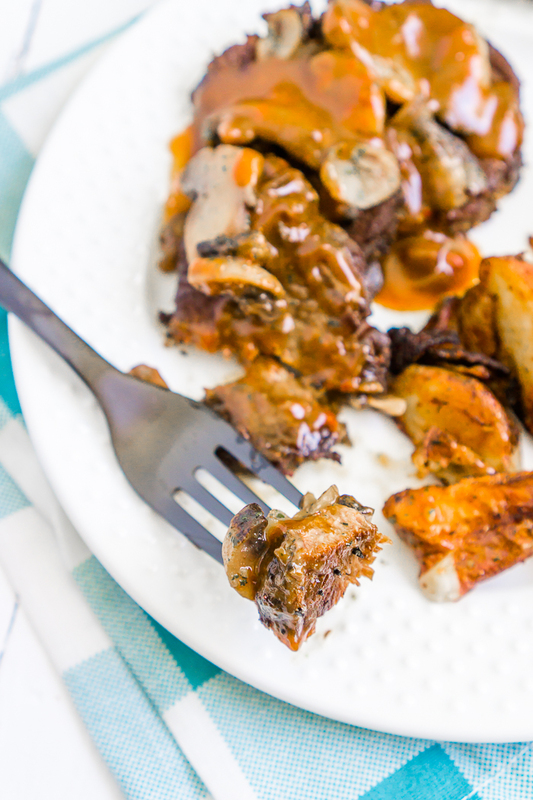 Pour sauce over steak and mushrooms. 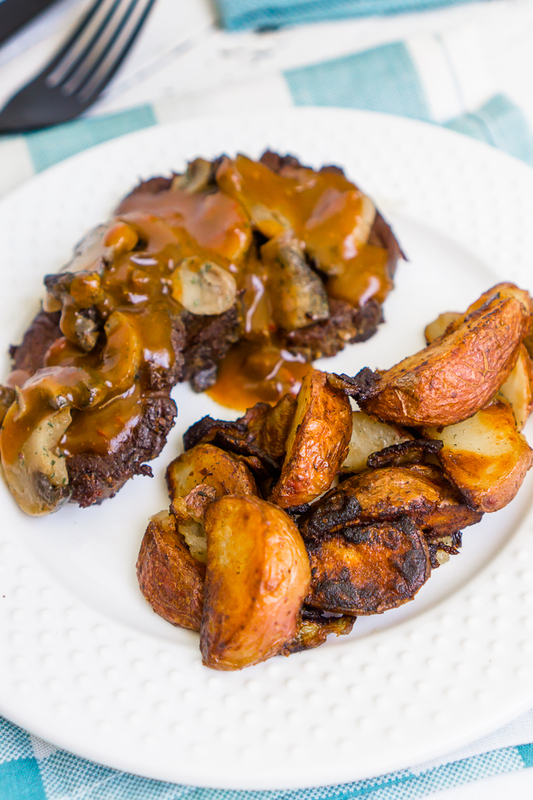 Start cooking the steak and potatoes at the same time so everything is finished around the same time and stays under 20 minutes of cooking!